At least 36 people, including 15 children, killed in regime air raids on rebel districts in Aleppo. At least 36 people, including 15 children, were killed in regime air raids on rebel districts of the northern Syrian city of Aleppo on Sunday, the Syrian Observatory for Human Rights told AFP. “An (aerial) attack using explosive-laden barrels over the Sakhur, Ard al-Hamra and Haydariyeh districts (of eastern Aleppo) killed 36 people, among them 15 children and an 18-year-old boy,” said the Britain-based Observatory. The Aleppo Media Center (AMC), an activist network on the ground, reported several helicopter attacks on rebel-held areas of the city. 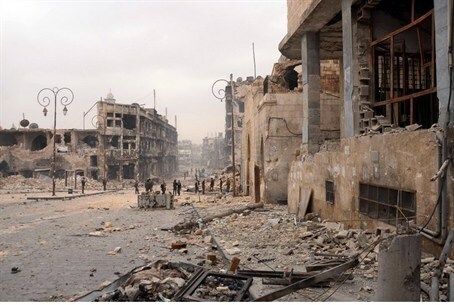 Aleppo has suffered massive destruction since a rebel offensive in July last year. The city is now divided into pro- and anti-regime areas, and according to the AMC, the regime uses its air force near daily to target rebel districts. The city has also been one of the regions in Syria where a second civil war has erupted, between Islamist rebels and the more moderate, Western-backed rebels seeking to topple President Bashar Al-Assad. Months ago, the 13-member Islamic Front for the Liberation of Syria split off from the main Syrian National Council opposition force and declared Aleppo to be an independent Islamist state. The Islamists subsequently turned on the moderate rebel groups. Last month a number of Syria's largest Islamist rebel groups united under the banner of the Islamic Front, putting their joint force of up to 60,000 fighters under one single command. The jihadists in Aleppo have set up a court based on Sharia (Islamic law) which is authorized to issue execution orders for serious offenses. Rebel battalions suffered a series of setbacks both in and around Damascus and Aleppo since the start of the government-led operation to root them out, but have since launched a number of counterattacks, including the recent capture of the town of Maalula to the north of the capital. Meanwhile, northeast of Damascus, at least 28 civilian members of minority religious communities have been confirmed dead in Adra since Wednesday, when Islamist rebels launched an offensive aimed at capturing the key entrance into the capital. “The number of civilian fatalities has risen to 28... among them Alawites, Shiites and Druze,” said the Observatory, according to AFP. The army has vowed to “crush” Islamist rebels in the industrial town, which has seen fierce fighting for five days. Most of the country’s Alawites - whose religion is an offshoot of Shiite Islam - support Assad, and many members of other minority groups fear a Sunni Islamist victory in the Syrian conflict. More than 126,000 people have been killed in Syria since March 2011, and millions more have fled their homes.